As per usual, It’s Monday is a meme sponsored by bookjourney.wordpress.com. Check out her blog and the others participating. Maybe you will find more books to add to that growing TBR list of yours. Now, it’s Monday again. My does the week go by fast. I am going to be very busy this month. Lots of cool posts and literary adventures. This Saturday I will be going to the Lit Crawl NYC in NYC. It will be my first time going. As I am not a drinker, I am more looking forward to the bars that involve writing stories, even literary trivia. Pictures and reviews will be posted, of course. This week I posted a few book reviews, as well as a book to movie review. Shadows by Paula Weston the first book in this debut author’s series The Rephaim. Two books are currently available for you to buy. It is a YA Fantasy book, similar to The Mortal Instruments series by Cassandra Clare. So, if you readthat series, or the spin-offs Clare wrote, you may want to give this book and series a try. I also read Just One Day by Gayle Forman. This is also part of a series, but only a two parter. The second book, available in October is called Just One Year. Can I tell you have excited I am over it’s upcoming release? My review can be found here. https://indiewritergirl0329.wordpress.com/2013/09/02/all-you-really-need-is-just-one-day-by-gayle-forman/ It is a quick YA novel that is as engrossing as endearing. It isn’t your typical YA book because there is country hopping, self-exploration that is realistic, but there is a cute guy. There must be. 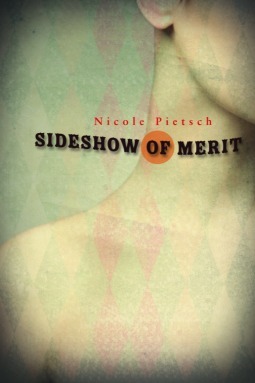 Currently, I am struggling with reading Sideshow of Merit by Nicole Pietsch. The cover is a little creepy, and doesn’t really coincide with the novel itself. I am thinking of putting it on my DNF shelf. The cover is strange, but the novel is slightly disturbing and just as confusing as seeing a neck on the cover. Busy, busy week for you. Good luck in your challenge, and have fun. I am out of town and not getting too much reading done, but I am having fun. Went to a Hachette book event and received 9 books. The event was FABULOUS. I am still here visiting my son…heading home tomorrow. That is awesome about the Hachette book event. Where was it and how did you get in? It was in New York City at Lighthouse International. 59th and Lexington. It was on Bookreporter.com, but since I went last year, they sent me an e-mail about it. If you want the contact information, let me know. I am sure they will add you to the list who receive the e-mails. That would be great! Thanks Elizabeth.